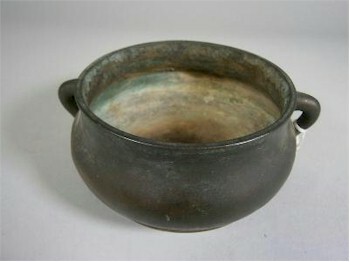 Chinese Metal Wares covers a wide variety of items produced by the Chinese. Perhaps the greatest number of articles that pass through the Works of Art Department are bronze pieces and cloisonné items. Since 1700 BC, the Chinese have been producing bronze goods not only for religious purposes but also for domestic use, music and warfare. Most were cast as sacrificial vessels and grave vessels so that the dead could continue to pay their respects in the afterlife. As with a lot of Chinese metal wares, shapes, styles and decoration have not changed over thousands of years and it is more often 19th century copies of these archaic pieces that are appearing at auction. Popular pieces include wine vessels such as Jue which is canister shaped with a pouring lip and raised on three peg feet; or Gu which is a vase shaped wine vessel. A Chinese Bronze Censer (FS19/521) was secured by a Chinese Internet bidder for £5,000 in a recent Works of Art auction. Censers for burning incense were often made of bronze and came in many shapes and sizes. The most often seen examples are of plain circular form with lion mask or loop handles and usually raised on three short peg feet. Cloisonné is an ancient technique for decorating metal wares using vitreous enamels, gemstones or glass. Originating in the Middle East, this art form reached China via the silk route in the 14th century. The technique involves forming cells (cloisons in French) with walls of thin silver or gold wire which are then filled with enamel paste and fired in a kiln, once cooled the enamel would be polished back to expose the wires. Using this technique, it was not difficult to copy familiar patterns and motifs that were used in porcelain production. Cloisonné was used to decorate all sorts of different metal wares including bowls, vases, censers, wine ewers, and often made for export to the West. These export pieces, like their porcelain counterparts, were copied in the West and soon designs and ideas were flowing backward and forward. Over the centuries, Chinese bronze wares have suffered many fates, either melting down or destruction through war and revolution. War with Japan and helping to arm the North Koreans have led to the collecting of bronze wares for guns and bullets. The establishment of the Peoples Republic also saw the destruction of all things old under Mao's elimination of the four olds: Old Customs, Old Culture, Old Habits and Old Ideas.